This classic adventure tale was a picture legendary filmmaker John Huston originally intended for Humphrey Bogart and Clark Gable in the 1950s, when he originally became attached to the idea of adapting Rudyard Kipling’s story into a movie. Twenty-five years later the concept came into fruition, and although the stars changed, it was still Huston’s able hands which guided the project through. 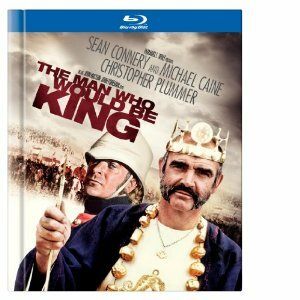 The Man Who Would Be King plays like a gangster picture. It just happens to take place in one of the most remote areas of the world. The fictional tale follows two British sergeants Danny Dravot and peachy Carnehan (played magnificently by Sean Connery and Michael Caine), who find themselves without a profession with no war in the empire. At first they work as small-time crooks, pickpockets, but they come up with a master scheme to become rich as kings. Traveling to the distant land of Kafiristan, Dravot and Carnehan smuggle a load of rifles into a place still using spears and arrows. They conquer and join each of the small tribes, creating a union which places them as kings at the top. This conquest becomes even luckier when a number of circumstances lead the people to believe that Dravot is a god. Like any gangster film, the rise must come with a fall when ambition turns to greed. Although the high definition presentation of this gloriously epic adventure buddy period film is gloriously realized on this Blu-ray disc, the highlight of the package is actually the packaging itself. The disc itself is inserted into a 32-page collectible book, including a back cover which holds the symbol of the Kafiristan priests. The book includes essays about the making of the film, cast and crew bios and spectacular production photographs. The disc includes a vintage featurette and theatrical trailer for special features.